"Swap out the mix-ins in this sweet café treat and create original flavors customized just for your family." Substitute your favorite nuts, such as peanuts, walnuts, pecans, or mixed nuts, for the pistachios. Swap out the dried apricots for another dried fruit, such as raisins, cranberries, cherries, or prunes. 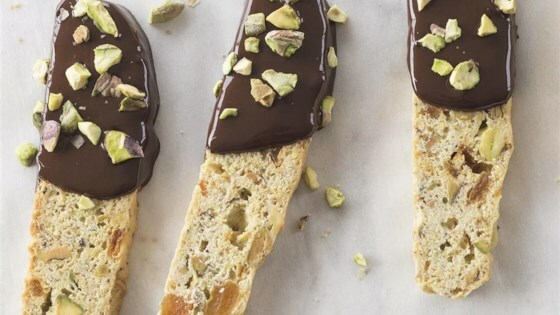 Enjoy this chocolate-dipped classic in no time! Letting them stand and dry on the parchment paper after you've dipped them in chocolate will ensure the quickest cleanup. You can also fashion small envelopes out of the parchment paper for a crafty, hand-made touch when giving these away to friends. Add decorative ribbon and these little treat packets are sure to please everyone! It was good but not awesome like I was hoping. Mine did not get crunchy...I may have underbaked it. I was hoping for a stronger pistachio flavor and didn't quite get it.